For Red Nose Day, I've been creating a new magic trick. I sell them and also make a donation to Comic Relief for each one I sell. If you buy one on eBay, then it's an automatic donation through PayPal, and if you want one directly from me, I'll do the whole trick at £6.50 and still make a £1 donation myself. So I enclose a video of it for you to look at. It's pretty easy actually, so if you want one, just contact me. I'll even send you a video of how it's done, but only after you've bought the trick! As you may know, I am starting a new website www.magicandmore.co.uk which should be up and running in a couple of weeks and I shall be devising tricks for seasonal use. I've just done a small one for Easter already, which is quite fun. Most of the magic tricks I will devise are alternative ways of doing tricks and gags that I already sell, and, as I always tell people who come to my magic workshops, learn how to do it and then put your own take on it. That's what every good magician does. I just give you the basics of what to do, and much of it is based on confidence as much as anything. "It's amazing what you can do in front of people without them realising." Anyway, there you have it. A nice short one today, and on Friday I shall be in various places making red noses appear. I'll be at the Arts Mingle on the 29th March at the MK Museum in Wolverton which is on from 18.30 - 21.00 where I'm hoping to be promoting the new website. 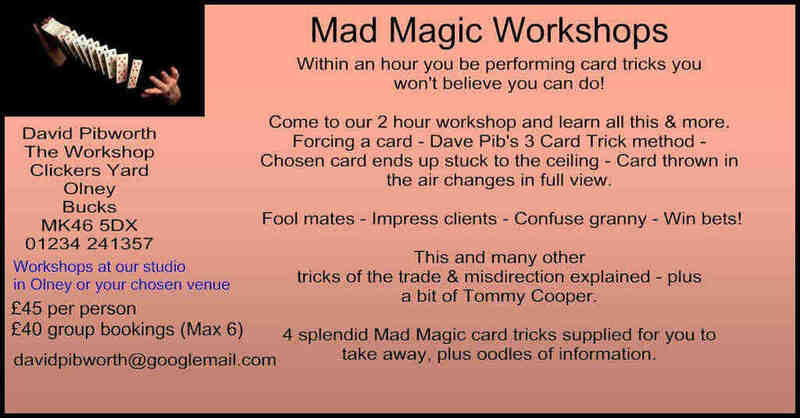 If you want see a bit of magic, just come along and say hello.